Oh the curious things that the internet can yield. 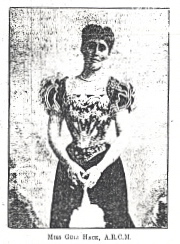 In this case, the fuzzy picture you see below of a young enterprising woman who was a student of Gustave Garcia (the son of Manuel Garcia) at the Royal Academy of Music, London, and taught singing at the Adelaide Conservatory of Music, Australia, in the last decade of the 19th century. Her name? Guli Hack. The enterprising part? 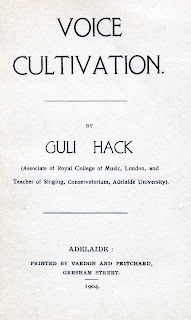 It seems that Miss Hack wrote a small 52 page book titled Voice Cultivation. I found a copy via Abebooks. And a curious book it is. Simple and direct in its instruction. The leading present day authorities are calling with a convincing unanimity for a revival of "the old Italian school" which, in generations now past, gave the world so many great singers and so many great masters. Are the methods of the old school mysteries? And, if mysteries, have all clues perished with the priesthood? There are writers who pessimistically affirm these things, but I cannot take so hopeless a view. It was not, after all, so very long ago, and there are connecting links. It is said that Anzani taught Manuel Garcia (the elder) the secrets of the school, with all its theory of vocalization, and it was upon these secrets that Garcia based his system. Then Manuel Garcia (the younger and greater), pupil and assistant to his father, spent his life, as he has told us, in developing the father's method. During my studentship at the Royal College of Music I had the advantage of the tuition of Gustave, the son and pupil of the great Garcia, and through him I feel that I am able to peep back and to understand some of the lost arts. And since these authorities agree that the latest scientific advances in physiology and physics add force to the correctness of the old school methods, so far as they are known, I do not despair of the return of a golden age of song. Above all, students must recognize that vocalization is not a pastime, but a study calling for intelligent, patient, life-long effort. Great singers have always worked. Indeed, it is one of the wonders of voice productions to note how often an excellent and even great voice may be developed from unpromising beginnings by intelligent work. A voice is given to us all- the volume, the quality, the range of it, are very much of our own making. Work is certainly one of the lost secrets, and the selection of the right vowel sounds for opening the individual throat and rounding the individual tone is another. It is not enough that we should sing; we must know exactly what happens when we sing. It is then that we are able, by the application of will power, to develop and control the muscles involved and so produce desired effects. One phase of modern life is physical culture by means of scientific exercises, and it is precisely this principle that we must apply to the instrument which gives us voice. Authorities say we can build this instrument as can build a violin, and that a great singers is physiologically a Stradivarius. It is because the process is one of physical building that we should begin early in life. It is not impossible, but it is difficult, to acquire true flexibility if we delay until the muscles are set. To give courage to those who are entering upon this study, I will assure them that, although peculiar excellence often depends upon a rare natural structure of the vocal instrument, almost everyone may have a cultivated voice. The measure of success will be ascertained by the individual intelligence and assiduity thrown into the balance. So much for the introduction. Here are further snippets to ponder since you may find it difficult to find a copy of the book. To breath properly the abdominal muscles must be slightly drawn in and the ribs expanded as far as possible. This is the method of the old Italian school. It is the method of Garcia and the one which I have used always with complete satisfaction. With constant practice the muscles of the chest, and in particular those around the lower ribs, enlarge and strengthen in a way that is at once interesting and remarkable. And aren't voice teachers always saying that singing is athletic? In singing, the breath must always be taken through the mouth. There are many objections to inspiration through the nose. Amongst them may be mentioned noise, slowness of supply, greater effort, and danger of intonation. As it is necessary for the singer to keep the passages of the nose hermetically sealed in expiration, it is tempting Providence to be perpetually opening them with inrushes of air. 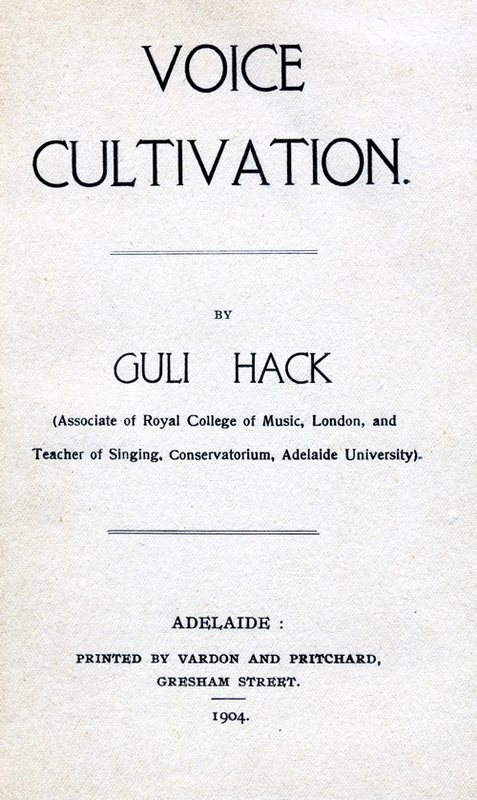 After the passage above, Hack warns women singers to avoid the corset while singing. However, this does not seem to have extended to a its inclusion in the picture above. A very simple experiment which makes us conscious of the existence of the muscles which control the vocal cords is to take a deep inspiration, and then hold the breath. The key to the superiority of the human resonator appears to lie in Helmholtz's law, that a narrow tube has a resonance limited to the particular note which has a vibratory wave-length corresponding to length of the tube, but that a wider tube is not so selective. The wider tube resounds not only on its own particular notes, some times above and below it. The wide tube has, therefore, a resonating range, and it is easily understood that the range of the human resonator may be immensely increased by the expansion and contraction of the muscles which form its walls, and by the lengthening and shortening of the tube effected by the rise and fall of the larynx and by the action of the lips. We are now able to see that a wide adjustable cavity is the best resonator, and to realise the value of "the loose open throat" which is so much the aim of the best teachers. The vowel a has been called basic, because in the production of it the position of the various parts of the resonator are natural and unstrained. The teeth are open about one inch, the lips naturally upon them, the soft palate is arched so that the muscles at the back of the uvula closes the nasal passages, and the tongue is at rest. The vowel o is obtained by preserving the same positions as for a, save that the lips are protruded, and the corners of the mouth are drawn together a little. The vowel u is obtained by a still farther protrusion of the lips and drawing together of the corners of the mouth. To obtain the vowel e the lips are kept in the natural position of a, but the tongue is raised in the middle so as to project the outcoming air vibrations upon the front of the soft palate. The position of i is the same, save that the tongue is raised in front sufficiently only to project the vibrations upon the front of the hard palate. The important matter in the productions of these five sounds and of their intermediate modifications is the maintenance of the loose open throat. It is for this reason that we make the natural position of a our starting point. The other sounds are produced merely by changes in positions of the lips or tongue. Whisper the vowel sounds loudly, and open the mouth and adjust the resonator until the sound comes most clearly, crisply, and resonantly. Then, without moving any part of the resonator, take a deep breath and sing the vowel. The advantage of this method lies in the fact that, in whispering, the muscles are not unduly constricted, but assume the loose openness which should be preserved during production of the subsequent tone. Another advantage is that during a whisper the student is better able to direct his thoughts to the dispositions of the various muscles of the resonator. It is advisable to practise before a mirror whenever it is possible- before a full length glass for position of the body, poise of head, and avoidance of grimaces; and before a hand mirror for the proper drawing up of the soft palate and depression of the root of the tongue. With the aid of a hand mirror the various parts of the resonator may be studied and a facility of adjustment acquired which will enable the student to ascertain for himself the positions of pure tone and maximum resonance. It will also lead to an intelligent control over the muscles of the tongue and soft palate, which cannot be acquired in any other way. Ah... Now there's rub. Too few students are curious enough to use the mirror, much less look into it on a daily basis during their studies. I once had a interesting conversation with a fellow teacher who wished that she had a magic mirror that only showed students their mouths. "The all look but they don't see!" But to return to Miss Hack's little book. As far as I have been able to ascertain, it is the first - and perhaps only - written record of the Garcia School in Australia. Now. To find more information on Guli Hack herself. Does the kind reader have any leads? The one I have found contains little information. I do know that she won a scholarship to study in England and returned to Adelaide to teach, married, and had a reputation for artistic excellence. Other than that? Miss Hack is a mystery. My favorite line in her book? Work is certainly one of the lost secrets.